With a band such as Radiohead or The Stooges you can quantify them, break the sound into reasons for why someone should dig them, but then you’ll have a Neil Diamond or The Minutemen and you know it is futile to even try, you either get it or you don’t, Treetop Flyers fall in the later, it is as simple as that, making them without a doubt the hardest band on The Best Albums of 2013 list to explain what makes this album so great. There’s something familiar, everything that was great (and terrible) about the late seventies/early eighties “rock” defines Treetop Flyers yet it feels new. Every track reminds you of a familiar song off in some fading memory that you just can’t place, I guess that is where the magic lies. Every song on The Mountain Moves reminds me of those few moments as a kid riding with my father in his pickup truck and a song would come on that we both loved. Treetop Flyers should have existed thirty years ago. 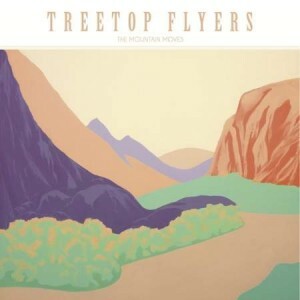 Treetop Flyers sound as if John Fogerty or Stephen Stills grew up listening to Ha Ha Tonka, it’s weird. Think of one or two great softer rock bands from the late seventies and imagine without hindrance of age that those bands had been able to progress continually up to this point, there is a fairly solid chance they would sound very similar to Treetop Flyers, that is what I’m trying to say. For once a band has been able to accurately pay homage to their influences without losing integrity or self-expression in the process. Many of the songs on The Mountain Moves (Loose Music/ Partisan Records) make me think of the years in my teens where I spent sneaking into bars to play open mics, every now and then you’d find a group of older gentlemen who would come with their wives and sit talking between sets like long lost friends, then for fifteen glorious minutes they would open their guitar cases and bring a hushed calmness on the room that felt incredible just to bathe in, ordinary dudes with no ambitions or fool-hearted ideas of labels and record sales, those dreams had long ago died, just playing from their souls in three-part harmonies with post-folk lyric structures, it was glorious. Treetop Flyers make me think, “what if those guys had managed to take that sound from those filthy stages of broken hope and transcended all they had expected to define them in life and somehow made a record,” that record would be The Mountain Moves, I’m sure of it. Stream the entire album here.